In a ruling likely to have a dramatic effect on territorial disputes in the South China Sea — and the world’s relationship with Beijing — an international arbitration court ruled Tuesday that there was no “legal basis” for China to claim “historic rights” in the waters. The ruling, handed down by the Permanent Court of Arbitration in the Hague, said that although Chinese navigators and fishermen have made use of the islands for generations, there is no evidence that China has historically exercised exclusive control over the waters within its so-called nine-dash line, which covers much of the South China Sea. In the disputed Spratly Islands, the tribunal surprised many observers by ruling on the legal status of every feature raised by the Philippines. It found that none of the Spratlys, including Itu Aba, Thitu Island, Spratly Island, Northeast Cay, and Southwest Cay, are legally islands because they cannot sustain a stable community or independent economic life. As such, they are entitled only to 12-nautical mile (22-km) territorial seas under the U.N. Convention on the Law of the Sea (UNCLOS), to which China and the Philippines are signatories. 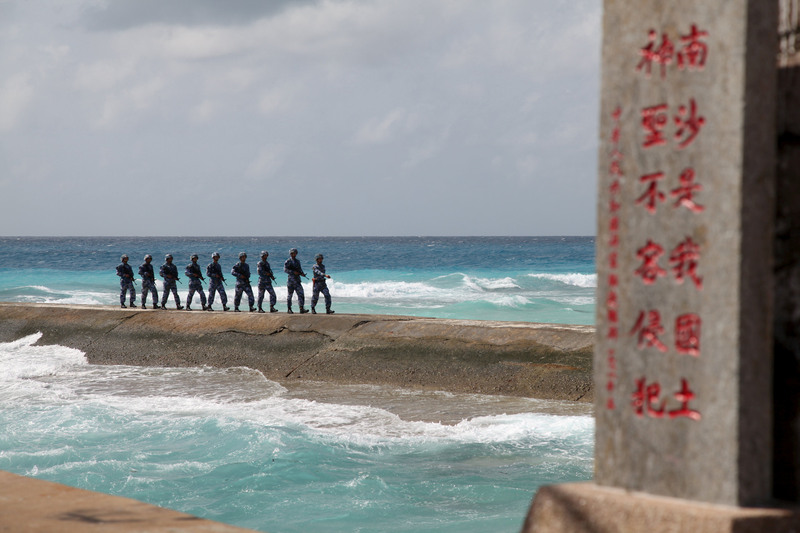 Of the seven Spratly features controlled by China, the court agreed with the Philippines that Johnson Reef, Cuarteron Reef, and Fiery Cross Reef — where Beijing appears to be building a 3,000-meter military-grade airstrip — are rocks. Hughes Reef and Mischief Reef, meanwhile, were found to be below water at high-tide, generating no maritime entitlements. The court disagreed with the Philippines on the question of Gaven Reef, finding that it is a rock, not a low-tide elevation. Additionally, the court ruled that Second Thomas Shoal and Reed Bank are submerged and belong to the Philippine continental shelf. 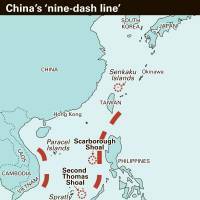 The ruling also appeared to come down hard on Beijing over its aggressive moves in the Scarborough Shoal — an area that analysts have described as a powder keg — ruling that China has violated the Philippines’ sovereign rights in Manila’s 200-mile exclusive economic zone (EEZ) there. China had also breached the Philippines’ sovereign rights by exploring for oil and gas near the Reed Bank, another feature in the region, the decision said. Beijing also took a hit over its massive land-reclamation projects, with the court blasting the construction of artificial islands at the seven features in the Spratlys. It said this had caused “severe harm to the coral reef environment” and accused China of reneging on its obligation to preserve and protect fragile ecosystems. However, the court said it lacks jurisdiction in Beijing’s military and maritime police standoff with the Manila involving China’s blockade and other harassment of Philippine troops on the grounded Sierra Madre in the Second Thomas Shoal. Although the ruling is binding under UNCLOS, Beijing boycotted hearings and vowed to ignore the court’s decision, saying the court lacks jurisdiction over the matter. While not empowered to decide on matters of territorial sovereignty, the tribunal applied UNCLOS to determine which countries can claim economic exploitation rights, based on the status of geographic features. The court, though, has no enforcement mechanism, meaning that any impact will depend on how the international community responds. China reacted with anger at the ruling. “China neither accepts nor recognizes it,” the statement said. 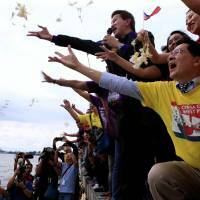 In Manila, the Philippine foreign minister called for “restraint and sobriety” in the South China Sea, Reuters reported. “Our experts are studying this award with the care and thoroughness that this significant arbitral outcome deserves,” Foreign Affairs Secretary Perfecto Yasay was quoted as saying. Analysts said the ruling defied expectations. “The verdict is the best case scenario that few thought possible,” said Richard Javad Heydarian, an assistant professor at De La Salle University in Manila. 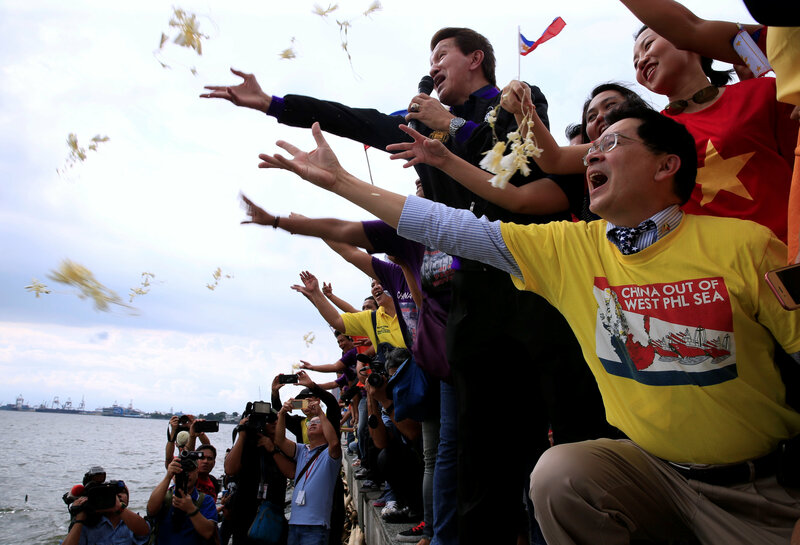 “It is a clean sweep for the Philippines, with the tribunal rejecting China’s nine-dashed line and historical rights claim as well as censuring its aggressive activities in the area. China embarked on its massive land-reclamation program in early 2014, stoking concern over its aims in the South China Sea, a key shipping hub through which $5 trillion in world trade passes each year. The Philippines, Vietnam, Malaysia, Taiwan and Brunei also have overlapping claims in the waters. 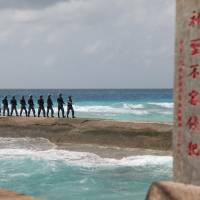 A Pentagon report released in May said that Beijing had paused its land-reclamation work in the disputed Spratly chain late last year after adding more than 3,200 acres (1,280 hectares) of land to seven features it occupies there. The report said the man-made islets there give it long-term “civil-military” outposts from which it can project power. The ruling is likely to have wide-ranging implications not only for Beijing, Manila and the other claimants, but also for Japan and the U.S.
Kirby said the U.S. was still studying the ruling and urged all claimants to avoid provocative statements or actions. “This decision can and should serve as a new opportunity to renew efforts to address maritime disputes peacefully,” he added. While it takes no position on sovereignty claims in the South China Sea — including those of its ally, the Philippines — the U.S. says it is deeply interested in maintaining maritime security, upholding freedom of navigation, and ensuring that disputes are settled peacefully. To these ends, the U.S. has conducted so-called freedom of navigation exercises near China’s man-made islets, angering Beijing. Japan, meanwhile, has long voiced its concern over China’s aggressive moves in the South China Sea, fearing that China could control the trade routes that are the arteries through which the lifeblood of much of the Japanese economy pumps. “Japan strongly expects that the parties’ compliance with this award will eventually lead to the peaceful settlement of disputes in the South China Sea,” Kishida said in a statement. Earlier Tuesday, Defense Minister Gen Nakatani said that the Self-Defense Forces would closely monitor Chinese activity in the neighboring East China Sea after the ruling. “We urge all parties concerned to react in a way that does not raise tensions,” Nakatani told a briefing in Tokyo. “We will keep a close watch on the situation in the East China Sea,” he added. While not a claimant to the waters, Japan views China’s moves in the South China Sea — including the building of military infrastructure on the man-made outposts — as an increasingly bellicose threat. In response to the moves, Tokyo has actively supported countries in Southeast Asia fighting Beijing’s expansive claims via diplomatic pressure and capacity-building programs. According to Hornung, the ruling could prompt a number of possible reactions. “Most of the ‘worst case’ predictions envision Beijing becoming increasingly aggressive, focusing its ire in the South China Sea,” he said. 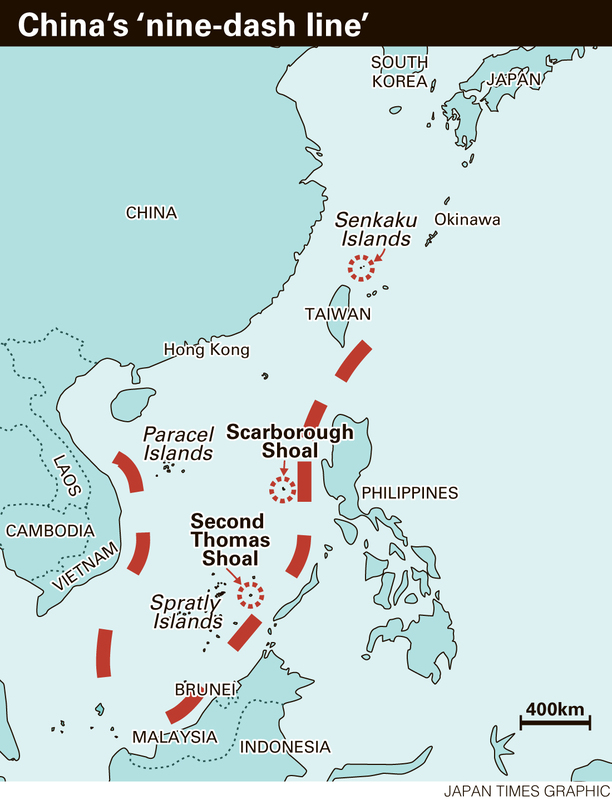 “This includes ramping up the militarization of its artificial islands, setting up a South China Sea ADIZ (air defense identification zone) or conducting land reclamation activities on Scarborough Shoal,” an uninhabited shoal just 230 km (140 miles) from the Philippine coast that Beijing wrested from Manila’s control in 2012. “Less considered, but just as plausible, is Beijing directing some of its anger toward Tokyo and ramping up activities in the East China Sea,” he added. In 2013, amid its dispute with Tokyo over the Japanese-administered Senkaku Islands, Beijing unilaterally established an ADIZ over the East China Sea. The area surrounding the Senkakus, known as the Diaoyus in China, has recently seen a noticeable ramping up of activity by Chinese vessels probing the waters — and Japan’s reactions. China had even alluded to a conspiracy by Tokyo — its former World War II nemesis — to steer the PCA decision away from favoring China, targeting the nationality of the Japanese judge who oversaw the tribunal’s formation. According to Hornung, the fact that a Japanese had a hand in the process from the very beginning may prove to be something that ensures retribution. Hornung said Beijng’s grievances over the judge’s nationality and other matters could result in an act of retribution.